On Monday night, I made cupcakes for a combined early birthday/Mother's Day celebration for my sister and mom. 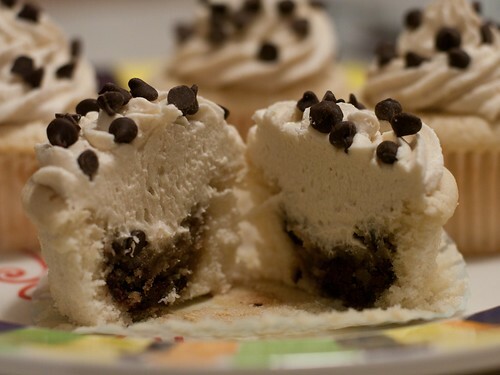 There was a yummy surprise inside these cupcakes - chocolate chip cookie dough! 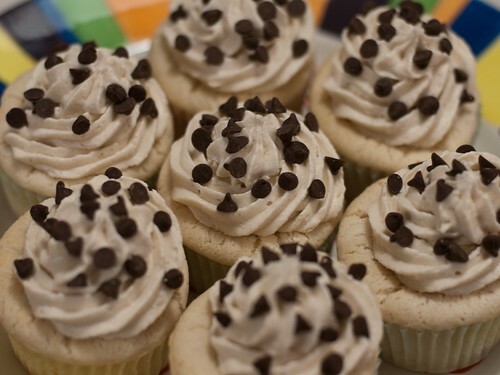 My BIL said they were possibly the best cupcakes he'd ever had! Michelle was excited to finally get some homemade vanilla extract after waiting months for it to ferment. And by special request, I made these kitchen owl towels for her birthday. For my mom, I embroidered all the granddaughters' handprints as a Mother's Day gift. You can see a lot more pictures from our trip on Flickr starting here. 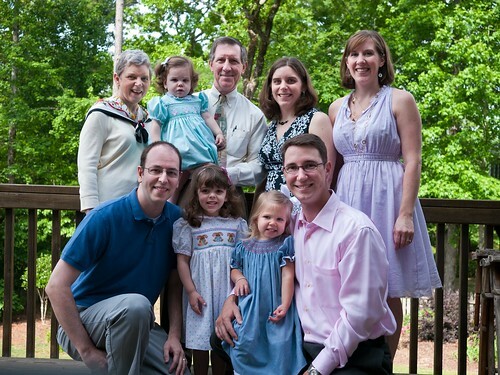 We traveled down to Birmingham (in "Alabana" as Molly likes to say) to spend Easter with my family. 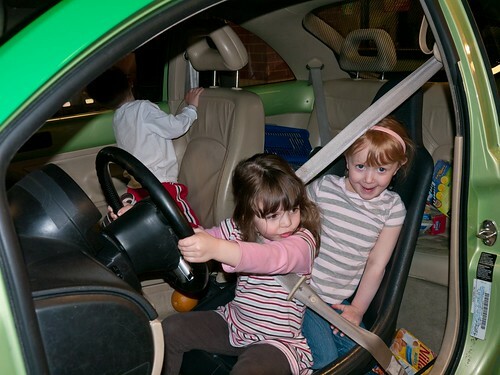 It didn't take long for the girls to get started on some cousin play. 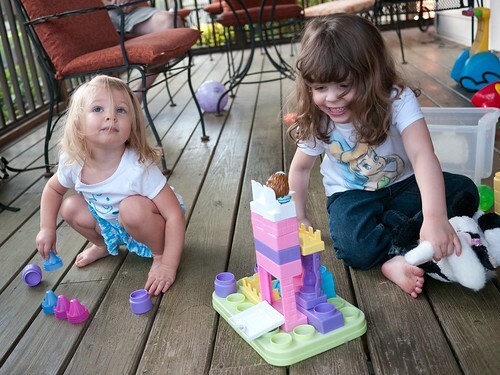 We spent lots of time playing on the back porch. 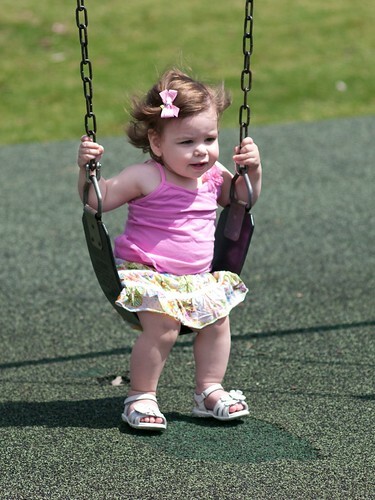 On Saturday morning, we all went to a nearby playground for some fun. 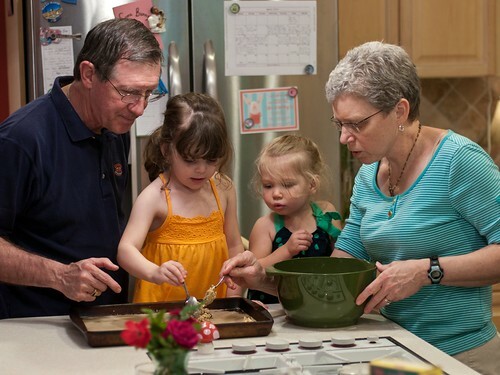 Making oatmeal cookies was a must-do for Saturday evening. 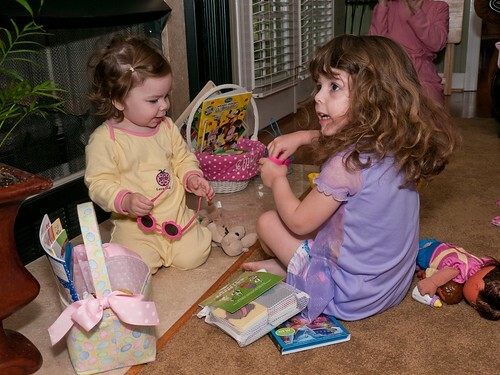 And the Easter Bunny did manage to find us in Alabama. 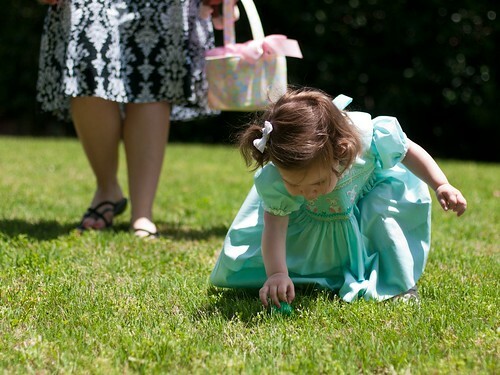 After church, Uncle J organized an Easter Egg hunt in the backyard. 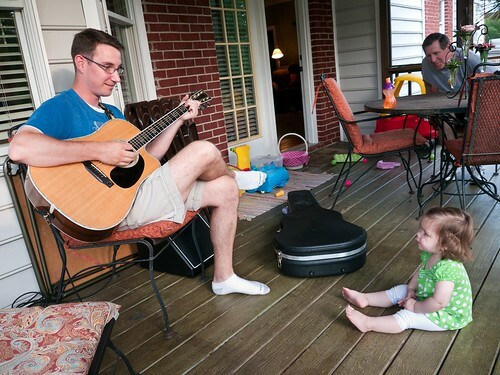 It was busy day, but Leah found a great spot to relax and listen to Uncle J's music. It turns out that everyone loves Minnie! (Did you know her full name is actually Minerva Mouse?) 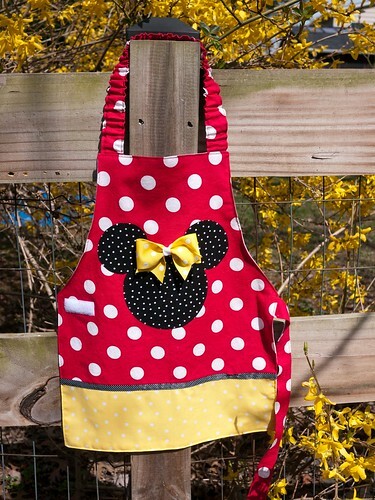 Molly has been invited to two Minnie Mouse birthday parties since her own, so I made this apron for Molly's classmate, Elizabeth. This is a taste of a regular day around here. One of Molly and Leah's favorite activities is playing music in Molly's room and dancing around. So, here's a bit of them dancing. As I've mentioned before, I am a staff liaison at my church. 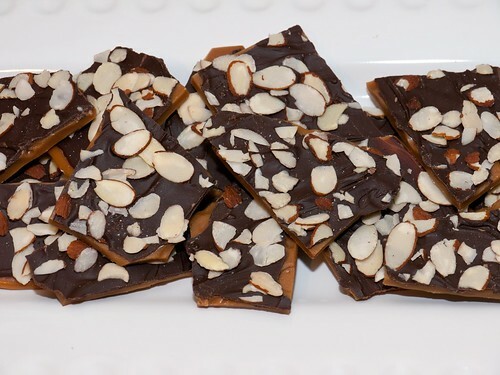 I wanted to make a birthday treat for one of the staff members, so I tried my hand at English Toffee. Our friend, Eric, made some using this Cooking for Engineers recipe a while back and it was so good. Mine got a big thumb's up in our house too. I also brought some to a few of my girl friends who happen to be in our own Biggest Loser club. Chad asked if I was trying to sabotage, but since I'm not trying to win this time, I called it "A friend bringing treats." Right?! 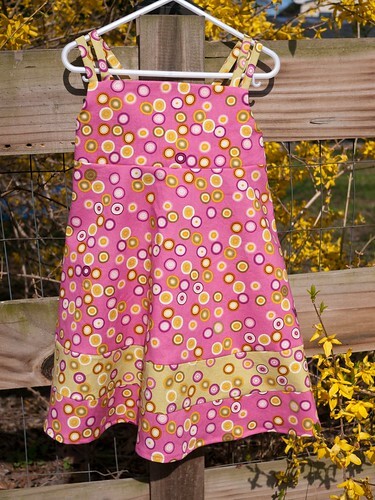 I made another birthday dress for one of Molly's friends, Keira. 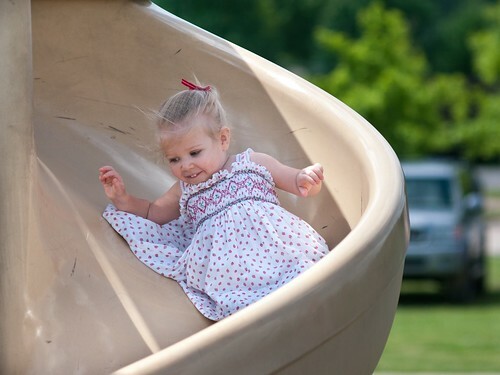 As you might guess, she is also in the popular 4-year-old dress phase. It's been fun trying out so many different patterns. This one is New Look 6613. 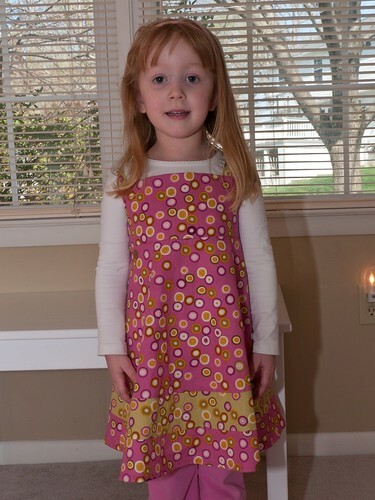 Edit: Keira came over to play wearing the dress I made for her, so here's the birthday girl in her new dress. 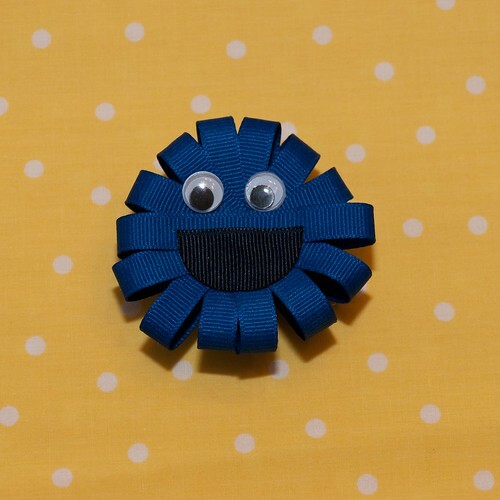 I also created a cookie monster bow for Keira's little sister, Maya, for her 2nd birthday. 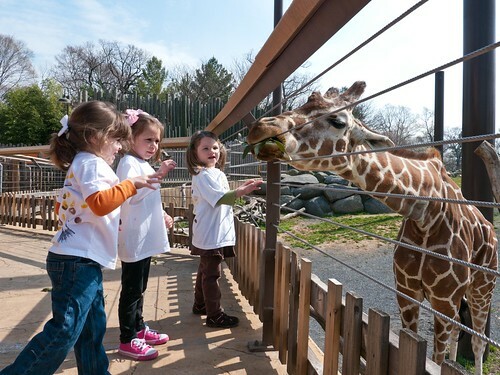 A bit of fun from the field trip to the zoo. They actually did their power walking for several minutes, but it didn't last very long once I got in front of them to take the video. They seemed to think I was a great target for attacking. 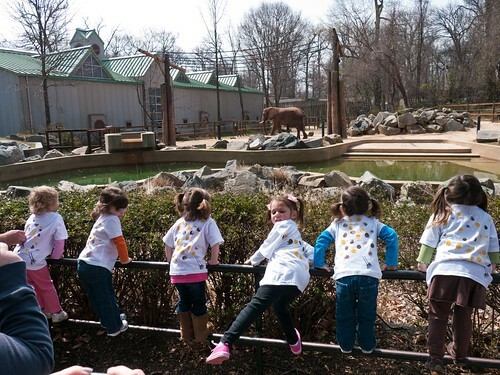 The big field trip of the year happened this week - the Maryland Zoo in Baltimore. I got to go as a chaperone along with many other parents. One of the highlights of the trip was that we rode in a school bus there and back. Here's Molly gazing at school as we pull away. 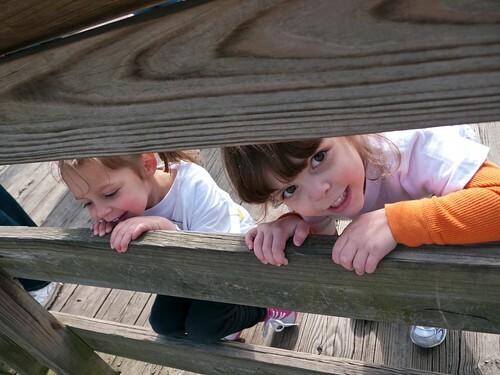 Once we got to the zoo, the kids were excited to see some animals. I believe Molly and Taryn are looking at some cranes here. 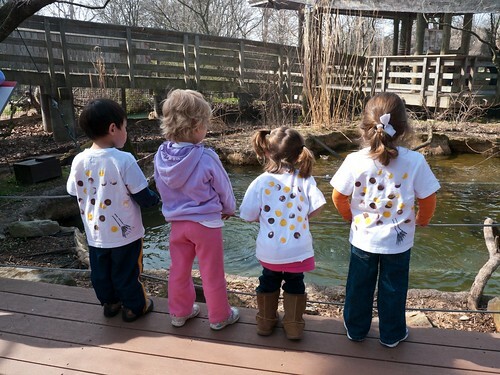 Here are Cole, Indraja, Jenna, and Molly watching the ducks in the African Aviary. We saw lots of big animals as well, like rhinoceroses, leopards, lions, chimpanzees, and more. 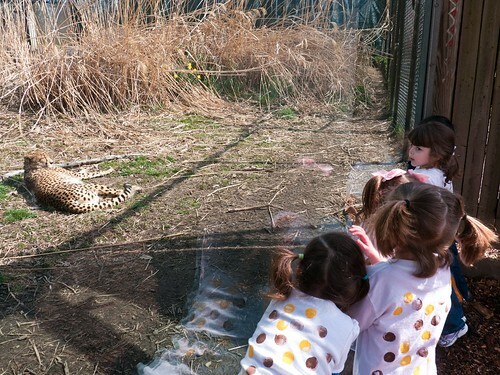 This cheetah was sleeping pretty close to the glass, so the kids decided it needed to wake up. They proceeded to shout "wake up" over and over at it. It didn't work, as the cheetah merely opened its eyes slightly for a second before closing them back. 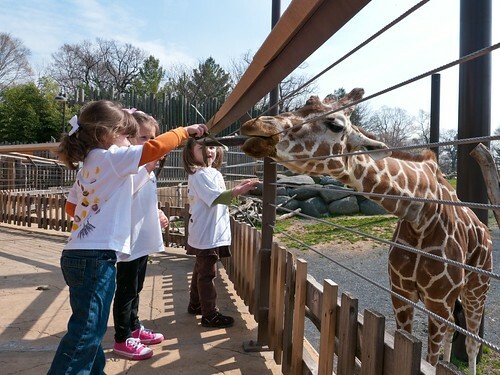 The kids even got to feed a giraffe. Here's Molly placing her leaves on its very long tongue. I'm surprised she was brave enough to do this. She's usually scared of animals, and this was a pretty big one. I think he likes it. And don't worry, Taryn and Ava already had their turn feeding it. 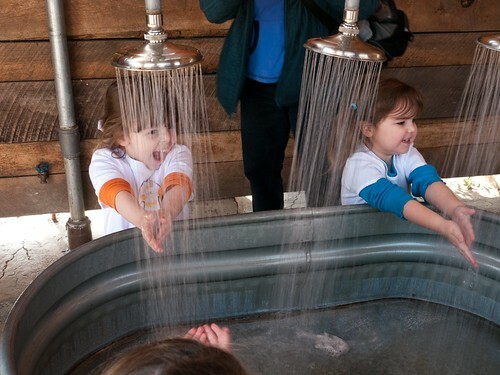 After feeding the giraffe, the kids got to wash their hands in this big basin with shower heads. They all got a kick out of it, especially Molly. All the kids climbed up to see the elephants. This picture is typical of most of what I saw all day - the backs of the kids as they looked at the animals. 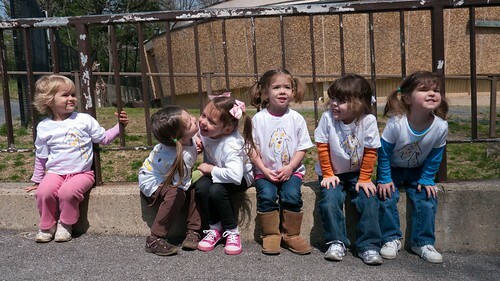 We tried to take a picture of the six girls that stuck together throughout the trip with the giraffe in the background (to go with their shirts), but posing six 3-4 year olds can be challenging. This is the best I got. We had to book it to get back to the bus on time, as no one wanted to leave. Fortunately, more fun was still in store for us - a bus ride home. 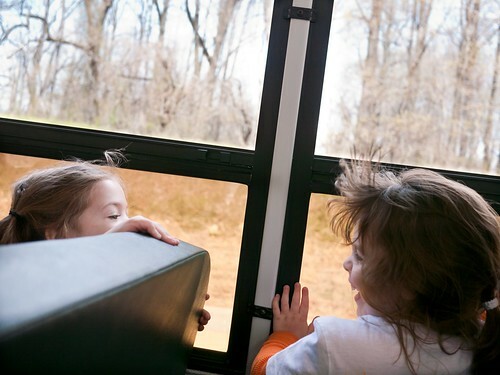 Here, Molly and Jenna are having fun with the wind blowing in their hair on the bus ride home for a few seconds before being told to sit down. It was a great trip, and the kids in our group had a great time. I'm very glad I got to go with them. There are a bunch more pictures on Flickr starting here. 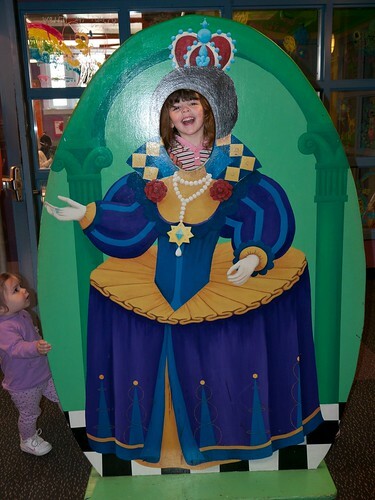 The girls and I headed to Port Discovery Children's Museum with our playgroup this week. 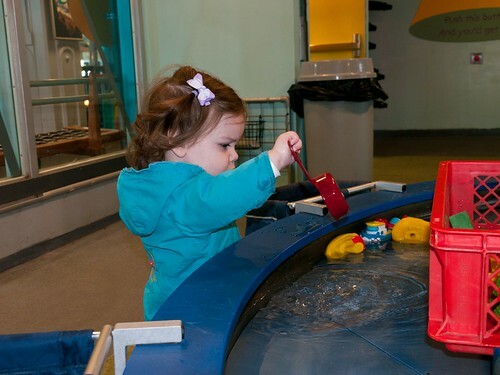 Leah loved playing in the Wonders of Water room. 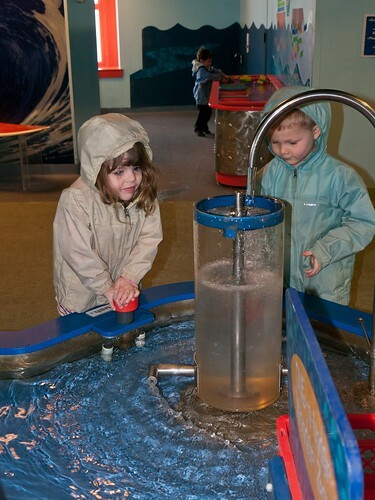 Molly and Simon had fun filling this cylinder causing it to spin due to the power of water. A couple of our playgroup dad's came along for the fun too. Zach is doing a great job overseeing the boat building. 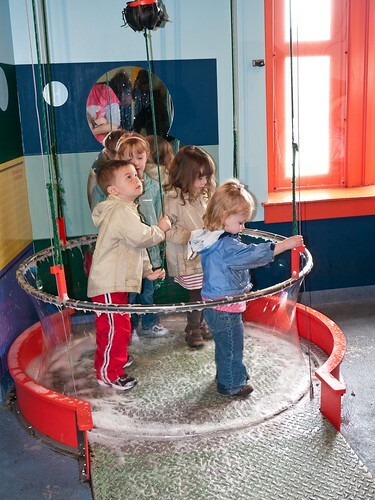 The museum has three floors of exhibits for the kids to discover. Any kind of "shopping" area was a hit! 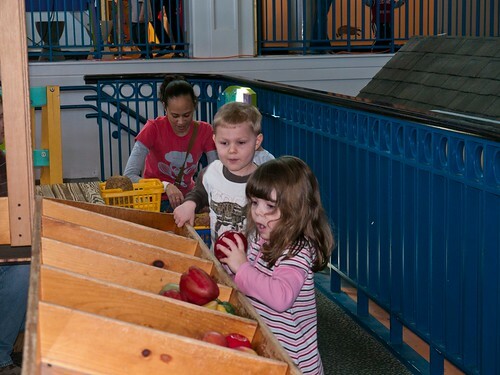 While the big kids played in the three story tree house, the toddlers checked out the new Tot Trails exhibit. 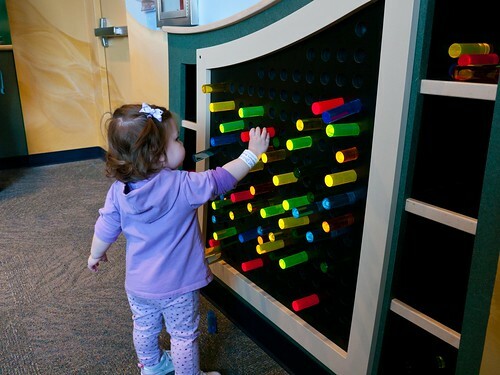 Leah liked making these pegs light up. 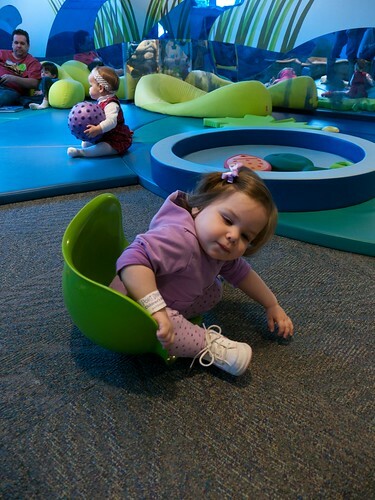 And she thought it was fun to sit in these seats that looked a lot like turtle shells. What happened to waiting until 16 before she got behind the wheel? The Music Studio was great. 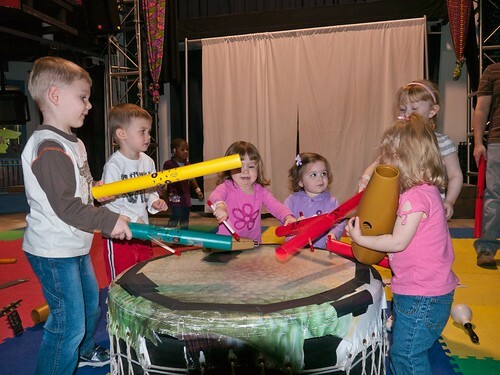 They loved playing with the Boomwhackers and the big drum. Queen for a day...or may be just a moment! 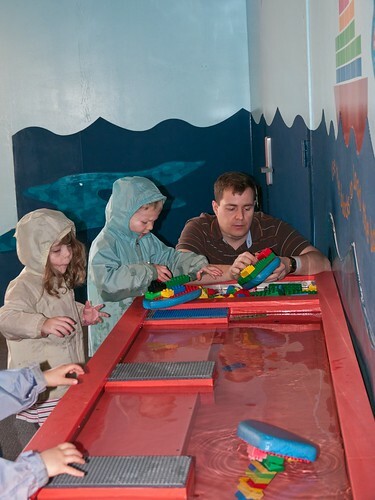 Before we left, the kids requested to play in the Wonders of Water room again. Standing inside the big bubble was a must-do since you've already seen that Molly loves bubbles! 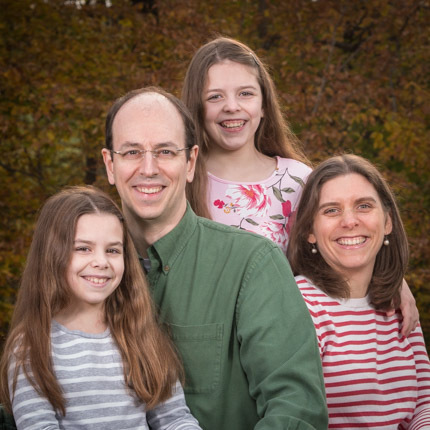 The girls and I went to Toys R Us armed with a gift card from Molly's birthday. 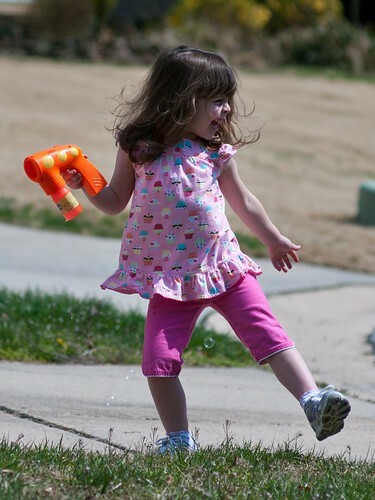 We returned with bubbles, including this bubble gun. 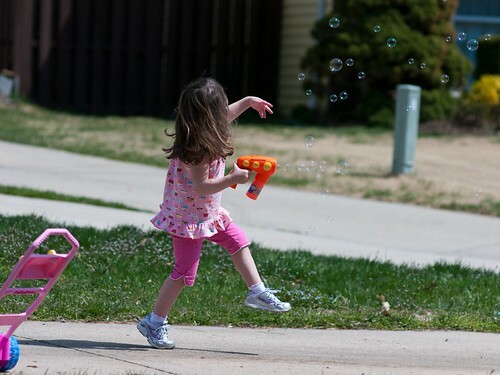 When was the last time you frolicked with bubbles? 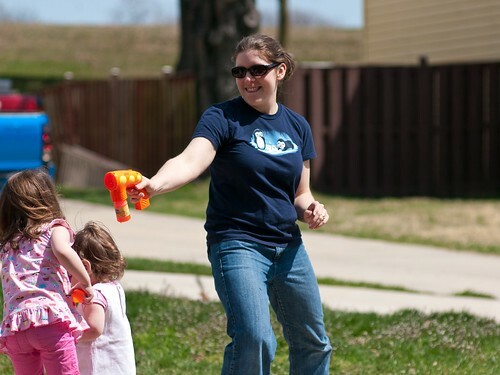 And I may have got in a little bubble gun action too! We've already had to replace the bubble solution and the batteries. 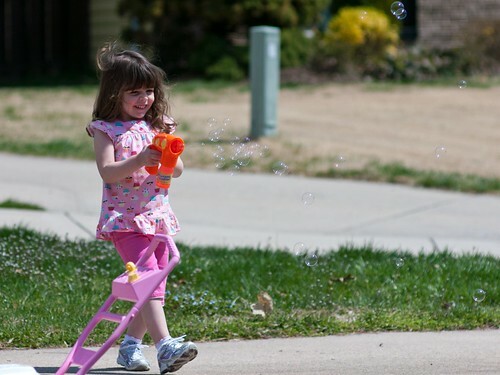 The girl loves her bubbles!